guns | Something should go here, maybe later. If you don’t understand US gun control, you should read this. If you think you understand US gun control, and don’t understand why the senate voted down Obama’s bill, you should read this. This is by far the best, most comprehensive post I have ever read on the topic. And it’s written by a far-left activist. It’s been less than a week since national gun control in America died. No “assault weapons” ban. No “high-capacity” magazine ban. Not even the Manchin-Toomey background check compromise that,according to Senator Mark Kirk, was reached by getting drunk on a 54-foot mega-yacht named Black Tie, which is part-owned by Manchin. Over the last several days, I’ve watched Democratic politicians, lobbyists and Facebook meme-sharers calling down shame on the senators who voted against every single gun control measure proposed in the Senate. Yes, it’s true that none of the measures would have passed the Republican-controlled House anyway, but to have lost in the Democrat-controlled senate was to truly be trounced. I have seen the Democratic pundits all over the nation looking across their podiums and well-lit television studio desks with stunned expressions. “How could this have happened,” they all ask? Only four months after Newtown? I write this letter as someone who is politically far left of center. You and I have a lot in common, though you may not want to admit it by the end of this article. I think it’s time we had a talk. I live in the state of Virginia, a place where it’s not easy to be a leftist. Just last week, our State Board of Health voted to approve TRAP(Targeted Regulation of Abortion Providers) regulations that would close most abortion clinics in the state. It was a devastating loss for myself and other organizers, and it will be even more devastating to the women of Virginia, most of whom will not have access to safe, legal abortions for years to come. I mention this not only so that you have context for the sort of political work I’m involved in, but because I want you to know that *I do know*, from very recent experience, what it’s like to feel powerless as you watch a group of people vote for social policy that you think is absolutely insane. But I’ll be honest with you: I watched the Senate votes live on Wednesday, and when these gun-related bills were defeated, I literally celebrated. Obviously, you and I have a lot in common, but plenty to differ on. And that’s kind of what I want to talk to you about. I’ve owned guns since childhood, and it’s an issue that I’ve thought and written a lot about. It’s very difficult for me to communicate with the mainstream Democratic establishment about guns. But because I know how painful it sometimes is to listen to Republican and other Right-leaning people talk about things that we on the Left care strongly about, I thought I would try to help you out. There are are a few things that you can do to improve your game in the gun control debate, and I thought it would only be fair to point out what they are. So here’s my best shot. Here are the things that you MUST keep in mind if you wish to further the dialogue on gun policy in America. This is a man that has built a cornerstone of his career on gun control legislation. He has headed and commissioned panels on guns. He runs a whole group of pro-gun-control mayors. This is an issue he has supposedly been devoted to for a long time. He doesn’t know how guns operate. He doesn’t understand basic terminology. He doesn’t know what an “assault weapon” is, even though he supposedly was involved in drafting legislation. How is this possible?And how is it possible that we who actually understand the topic are supposed to cede to his judgment on it? He’s not alone in his utter baffledness about this. Obama recently told donors at a Democratic Congressional Campaign committee meeting that students at Sandy Hook were gunned down by a “fully automatic weapon”. How can you lobby and legislate for years on a topic, and yet be so utterly ignorant of the topic? I don’t have the answer to that. But we all know how such appalling, wanton ignorance goes down in communities where even a school child knows the difference; communities regularly portrayed by certain sectors as ignorant hicks. I don’t know about you, but I can’t think of a quicker way to divide a country. Like I say, it’s a very comprehensive post. Go have a read. Bill Maher is a liberal who has a show on US TV. I haven’t seen much of it, but I understand it’s the usual liberal sneering. Thing is, Bill has long called himself a libertarian. He’s clearly not a libertarian of course. It was always ridiculous, but what’s even more ridiculous is that he’s now trying to explain the difference by claiming that libertarianism somehow changed while he wasn’t looking. For starters, the fact that he somehow believes libertarianism was ever a movement not predicated on a belief in free market economics is astonishing. The ideology never “morphed” into a free-market “obsession,” as he believes. In fact, the study of markets has always been a fundamental part of the movement, from the Austrian school of economics (F.A. Hayek, Ludwig von Mises) to the Chicago school (Milton Friedman, Gary Becker). When Maher declared himself a “libertarian” back in 2001, Salon declared it a “joke,” noting that only a handful of his beliefs (specifically in the social issues realm) overlapped with libertarian ideology. His staunch support for the expansion of government over guns, education, business, etc., were all in direct opposition to what libertarians generally believe — and yet, somehow, he bizarrely believes to this day that the movement left him. Read the whole thing. It’s quite funny. Oh, and I wonder if anyone has a count on how many times this guy’s run stories on how conservatives are stupid. Also, check out what law-enforcement has to say about Obama’s gun control ideas. After spending much of the day commenting on Kiwiblog, I have complied this chart from data at this anti-gun site. 1. The gun murder rate pretty much follows the general murder rate. 2. The 30,000 “gun deaths” quoted in the media is very deceptive as this includes suicides. 3. 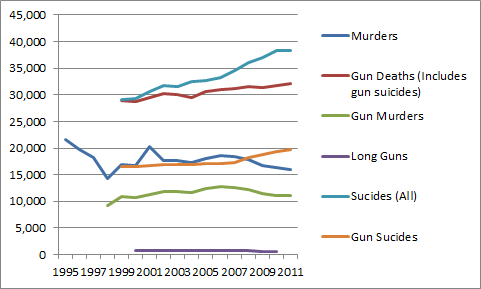 Gun suicides are going up, but so are suicides in general. 4. It’s suicides that are driving the gun deaths trend not murders. 5. “Long guns” (which includes rifles, shotguns and assault rifles) hardly feature. The majority of US gun murders and other deaths are from small, easily hidden hand guns with only a few rounds in the magazine. So not only are the media playing with the numbers to make the problem seem worse than it is, the focus is on the wrong sort of guns. FYI, the US suicide rate has now matched the US suicide rate – ours has actually dropped a little. In other words, even without a gun culture and gang issues (which account for many of the murders) we were until recently killing ourselves at a far faster rate that the USA. There are a variety of ways of responding to a massacre of innocent people. This probably ranks up there in the top 10 worst ideas. A gunman killed his mother, drove to an elementary school and massacred 20 first-graders and six adults, then shot himself. All the weapons used were legally owned by his mother. This being the internet, the response has been overwhelmingly mature. Or not. But never fear, the journalists in question are ever ready to pat themselves on the back for their courageous decision to publish a massive amount of personal data for ends they themselves probably can’t quite articulate. Irony no. 1: No doubt quite a number of those gun permits are for people who’s job only exists because some people use guns irresponsibly. Irony no 2: Newspapers can be used irresponsibly too.